Exploiting the tradition and the tradition of exploitation. The polyester fabric, hand sewn with black roses was part of a blouse used in a folkloric dance ensemble in Timisoara, in the eighties. Part of the employing of tradition for the purposes of national communism. Folklore exploited as a way of shaping national identity and of writing nationalistic history (as folklore often is). Cantarea Romaniei (the Song [of praise] to Romania), an annual festival initiated by Nicolae Ceausescu's regime, where amateur and professional artist showed their work in the frame of nationalist ideology. Black roses hand sewn in a traditional pattern on a polyester fabric. My grandmother sewn and embroidered for me and my sister traditional blouses, "la blouse Roumaine", on a similar polyester fabric. Because she found pleasure in embroidering. Because it was easier to use the polyester canvas, compared to the laboriously hand woven canvas that was traditional. Because she wanted to refer to a tradition, to a link to the women before her. A tradition that most of the time had nothing to do with the edulcorated image of the village exploited in the official rhetoric. "La blouse Roumaine" is again in fashion, in the same nationalistic vein, with the same conservative view on women, but this time on the globalized market. Traditional blouses rediscovered in villages. Blouses interpreted as signs of national identity, of nationalistic pride. Also, blouses referring to an image of the "traditional" woman, so modest, so skilled, so full of good taste, living a life of harmony. Gracefully doing her labors of love. An interpretation that erases the real lives of hard work and sacrifices and exploitation of the women who had sewn that blouses in their moments of rest and pleasure. Also, in shopping malls, traditional style blouses mass produced by women in far away sweatshops. Exploiting an (invented) image of tradition in the tradition of exploiting workers. 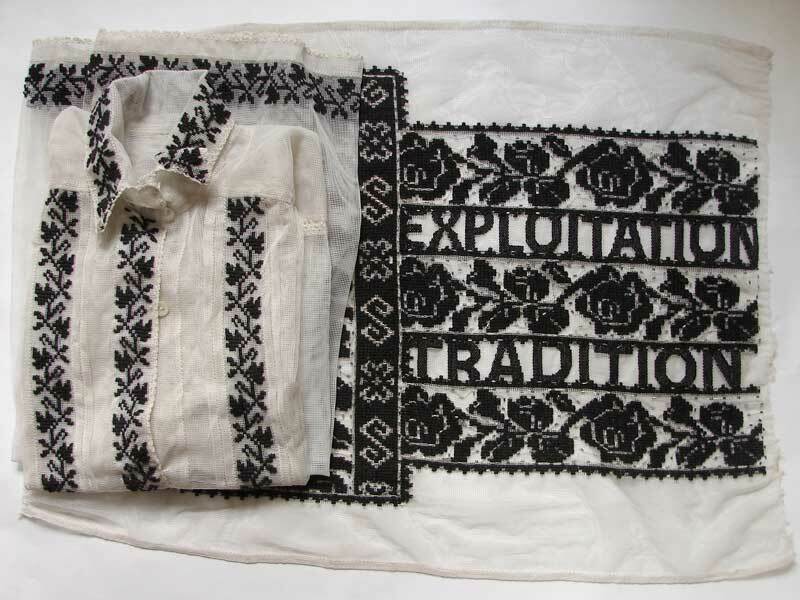 The Romanian blouse, traditionally sewn or mass produced, worn in Romania or abroad sold as a package of evasion, conservative views of femininity, imagined "authenticity", erasure of the exploitation of labor, exotisation of rural women. 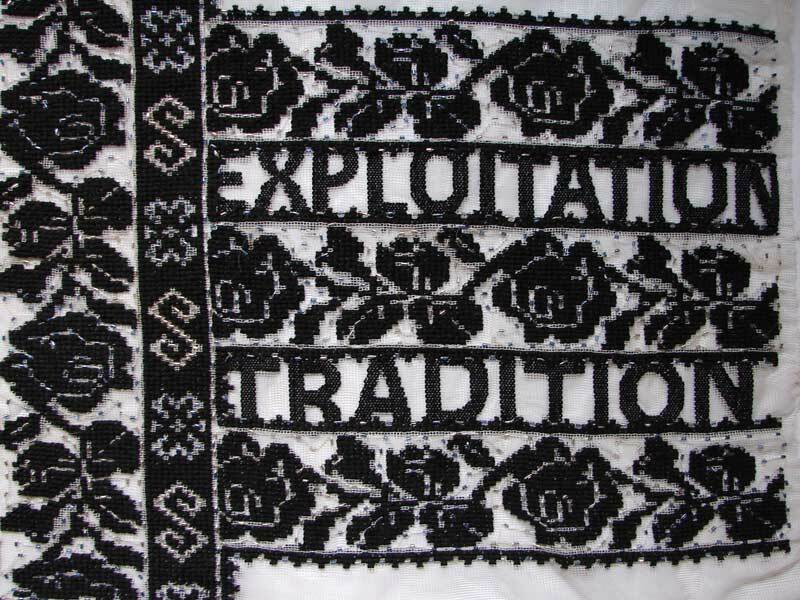 Black roses hand embroidered on a historically charged polyester fabric, and the words "Exploitation. 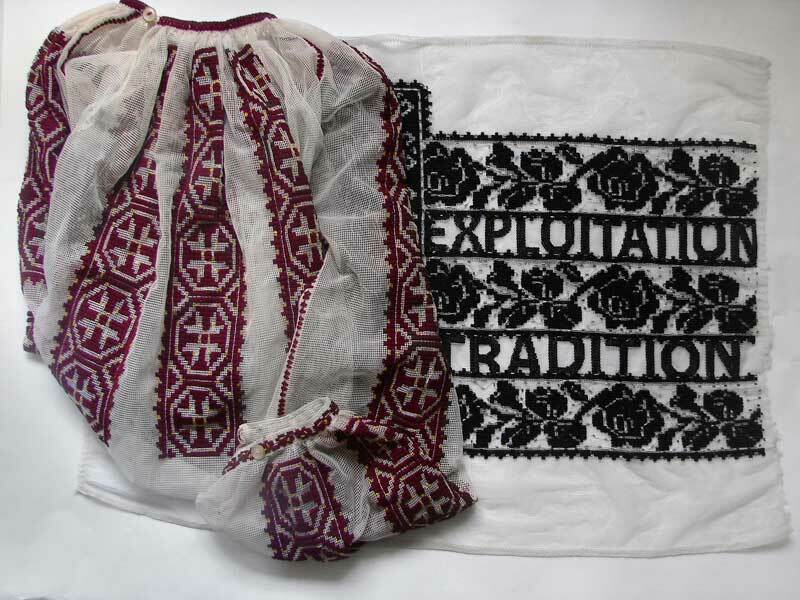 Tradition" embroidered by us, speaking about recent history and about today.